I am looking for information on Ted Cruz or John Cornyn. They are United States Senators from Texas. Information about them can be found at the United States Senate Web Site. Determine who your Senator is by filling out the form on the "Who Represents Me?" page, provided by the Texas Legislature Online website. You will need to provide a street address. How can I find out about recent legislative action? 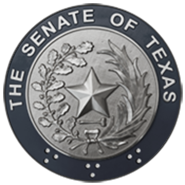 The Texas Legislature Online website provides legislative information including bill information, committee information, journals and much more. How can I e-mail my senator? E-mail is handled by each Senator's office individually. Those Senators who do accept e-mail will have an e-mail form on their web site (found on the Senators index page). Please DO NOT contact the website administrator about legislative concerns or attempt to contact your Senator via the web administrator. Such e-mails will not be answered, and cannot be forwarded. Where can I get a list of all the Senators' e-mail addresses? There is no such list because not all Senators accept e-mail. Those who do accept e-mail prefer that you use the e-mail form on their website (found on the Senators index page). Where can I get a list of all the Senators' mailing addresses and phone numbers? There is a complete list of Senators with addresses and phone numbers at the Senators Full Directory page. How do I watch/listen to the proceedings streamed via the "Live Video" or "Audio/Video Archive" pages? Streaming of video proceedings is provided through our streaming video partner, Granicus Labs. Videos are available to view right in your web browser. Please consult this page for recommended system requirements and other helpful information related to video streaming. Can I view Senate video broadcasts on my mobile device? Yes — Video broadcasts are available to a variety of compatible mobile devices. Please consult this page for full system requirements and other helpful information related to video streaming. What does it mean when the video player reports, "The system was unable to find the content that you requested. The content may be in the process of transferring to a distribution center"? This usually means that a recently completed broadcast is currently uploading to our streaming video partner's datacenter, which is an automatic process. When the upload is complete, the video will immediately become available for viewing. How can I get an audio copy of a Senate meeting? Senate hearings are available on cassette tape or CD from the Senate Staff Services office; hearings from before the 80th session are on cassette tape, while all hearings during and beyond the 80th session are on CD. Please call Senate Staff services at (512) 463-0430 for more information. No. Senate Committees are not recorded to videotape or DVD. The digital streaming videos found on this website are the only available video content, and are available any time on our website via your web browser. If you require a personal copy of a hearing, the official audio recordings are available from the Senate's Staff Services office (see above).